Now Available. A thrilling, human story that takes you well beyond the world of hockey. 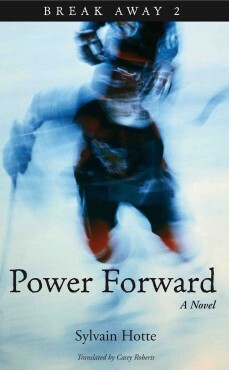 “Set against the backdrop of the highly charged world of competitive junior hockey, Power Forward captures the often random combinations of naïveté and smarts, impulsiveness and calculation, and compassion and cruelty experienced by young people on the verge of adulthood. (…) it works well as a standalone…” Stephen Knight, Quill and Quire, June 2012. “I love this second book in the series (…) it can be read alone. Sylvain Hotte’s descriptions of the St. Lawrence make you want to go there and he finely develops his characters in the Quebec City setting. (…) Highly recommended for boys…. but also for girls.” SOPHIE Lit. Sylvain Hotte is an award-winning writer of fiction for young adults and children. Born in Montreal to an Innu mother and a Québécois father, he now lives in Quebec City. Power Forward is the second in the Break Away series after Jessie on My Mind. Casey Roberts won the John Glassco Prize awarded by the Canadian Literary Translators Association for his translation Break Away 1, Jessie on My Mind. He lives in Montreal.